No matter what sort of travel blogger you are, there’s bound to be a certain type of post that you hate writing – some of us hate writing listicles, some of us detest writing personal stories, while others loathe penning those long-winded info-dense posts that take forever to scribble down. I don’t mind writing any of the above, but there is another sort of article I find it tough to even think about writing, to even decide whether to write about, and that’s the sort of post that talks about those hidden travel gems. On the one hand, I’m completely driven to tell other travellers about such places – to let people in on the secret of these utterly incredible spots I know they’re going to love just as much as I have. 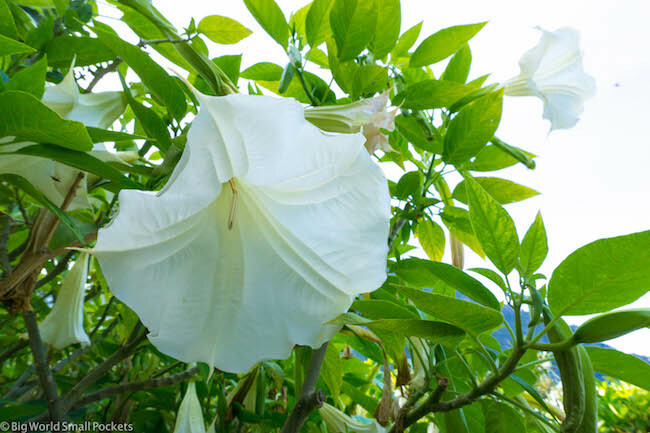 On the other hand, I know that it’s exactly this act of telling others, of spreading the news, that is likely to contribute to the very demise of this hidden jewel, to help turn it from a gem into yet another overrun touristy disappointment. And never is this more true than when talking about a country already squarely on the tourist map, about a region already heavy laden with lobster-looking tourists, about a coastline already bulging at the seams with development. And amongst all this, one undiscovered pearl glistening on the shoreline, as yet untainted, untouched, untrampled. Turkey’s coastal dream that’s yet to be filled with resort-like hotels, English-style pubs and rows upon rows of sunbeds! 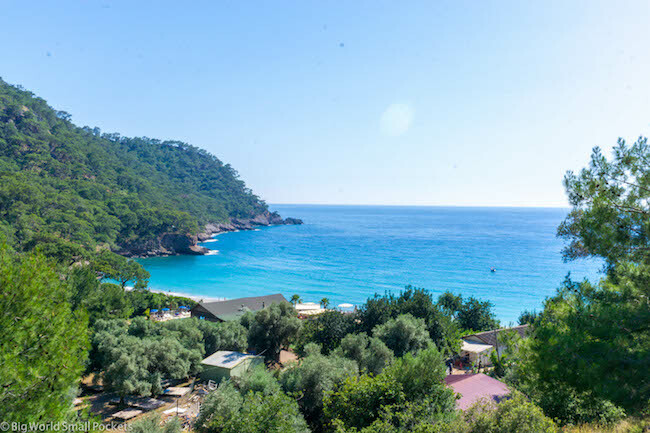 Kabak is perhaps the only undiscovered stretch of Turkey’s Mediterranean coastline that is still wonderfully underdeveloped – a tiny patch of idyllic natural hilly forested goodness that rolls down to the glistening, turquoise sea beneath one huge blue, unpolluted sky. A tiny cove, surrounded only by gorgeous hikes, fresh waterfalls, stunning views and a few wooden chalets, this is the place where the road ends, indeed perhaps where the very world ends. Yup here there are no roads, no cars, no banks, no phone signal, no real shops to even speak of. And as such, Kabak is just the sort of hidden retreat and solace so many of us yearn for when we travel. The kind of secret escape where its very magnetism lies not in the attractions to see and do and tick off a list, but in the attractive lack of them. Of really being on holiday, away from it all. Because Kabak is the place you come to do as little as you can. So as you might have guessed, the Kabak vibe is pretty freaking chilled. This really is the epicentre of chilled. Camping in the forest is part of the experience here and with very few “real” hotels, restaurant and general amenities, there’s not much choice! 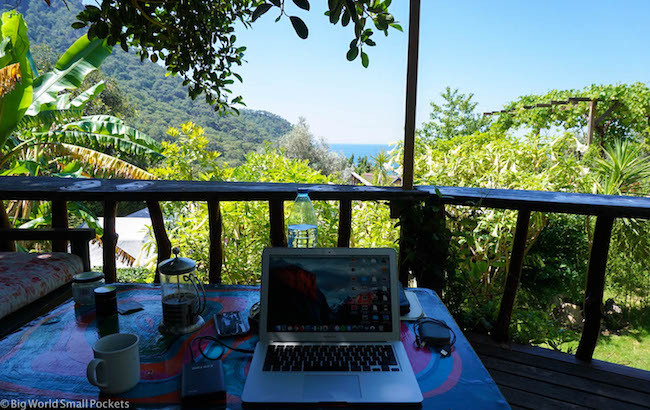 The Kabak vibe is mostly about enjoying the beautiful nature in this part of the world, about waking to the sound of the birds and about rolling down to the beach around mid-afternoon, after a long and lazy morning. 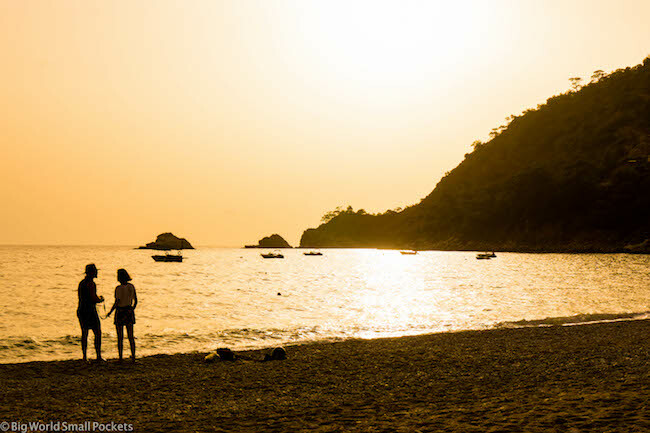 The Kabak vibe is about enjoying the sunset with a beer, sandy toes, salty hair, few plans and the sound of the ocean. It’s a pretty alternative place, the sort of place where shoes are optional (as a life choice) and people get trapped for weeks, months, if not years! It’s also a very local vibe, with mostly Turkish people coming here (told you it was a well-guarded secret) and few international tourists. In my opinion, this makes it even more delightful. In fact, everything about Kabak is delightful. I was there for 10 days. It could have been a lot longer! Situated between the cities of Fethiye and Antayla on Turkey’s Mediterranean coastline, Kabak is located in the south of the country. It is, as I’ve said, at the very end of the road – the only reason it’s probably managed to remain as untouched as it has, while the rest of the coast around it has developed at a crazy pace. But being at the end of the road doesn’t make it that hard to get to – it more proves how lazy and unadventurous most of us are! Ok, well it doesn’t make it impossible to get to, let’s put it that way. All you need to do is get a mainline coach to Fethiye’s central bus station from just about any other major city in this half of Turkey. From there, hop onto the shuttle minibus that frequently departs from outside the nearby Carrefour Supermarket towards Oludeniz. 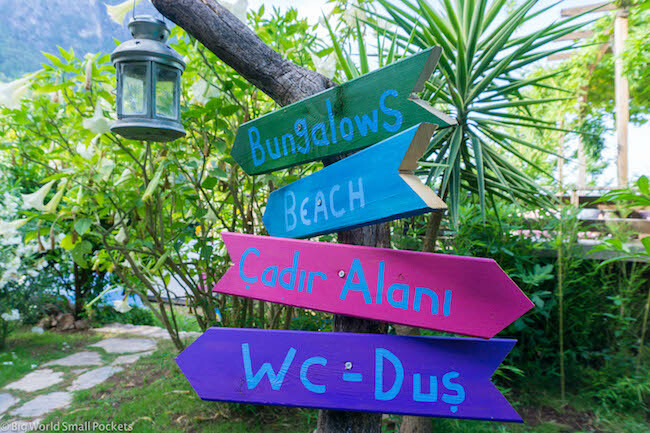 But do not get off at Oludeniz. 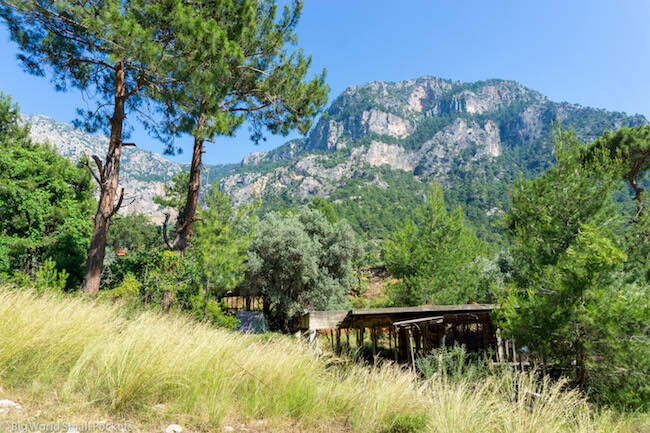 Instead, wait as the bus leaves Fethiye, drives to Oludeniz, waits there (as it drops off and collects some passengers) and then continues along the coastline on a road that hugs the cliffs and the increasingly gorgeous views. After about another half an hour, you’ll reach Kabak, the very last stop, which has a very useful sign marked “Kabak. Last Stop” in huge letters. Here you get off the bus, before it turns around and heads back to Fethiye. As you get off the bus you’ll see one restaurant and one shop, but don’t be confused! This is the top of the village, where the real action happens is in the valley you can see below you! So now the fun starts as you descend the steep, rocky track on foot to the village, the beach and the glorified campsite you’ve chosen to stay at. #1 Turkey Lonely Planet – Still my go-to when it comes to guidebooks, the Turkey Lonely Planet packs in a huge amount of information and will likely save you the cost of a guide in many of this country’s fabulous historical attractions and rich cultural cities. #2 Good Camera – From the lunar landscape of Cappadocia to the azure turquoise waters of the Mediterranean, the bustling bazaars of Istanbul and ancient ruins of Ephesus, you’ll need a good travel camera for Turkey and the Sony A6000 mirrorless ticks my box every time! #3 Headscarf – If you’re heading to see any mosques in Turkey, ladies will need to come prepared with a headscarf to enter, as well as a long skirt or pair of pants and long-sleeved top. #4 Beach Gear – A lovely bikini and gorgeous sun hat are essential for looking the part on Turkey’s Mediterranean coastline. #5 Rain Jacket – I visited Turkey in May, technically the start of summer and the high season, but was amazed how chilly and wet it was in some parts of the country like Istanbul and Cappadocia. Having my North Face lightweight, windproof and waterproof jacket therefore saved my life! Yup, the whole reason to come to Kabak really is to do very little. It’s a complete chillout zone, where the lack of phone signal allows you to feel completely cut off from the outside world. Long lazy days are broken up only by trips to the beach, snorkelling fun, sunbathing, swimming, having a coffee and relaxing! 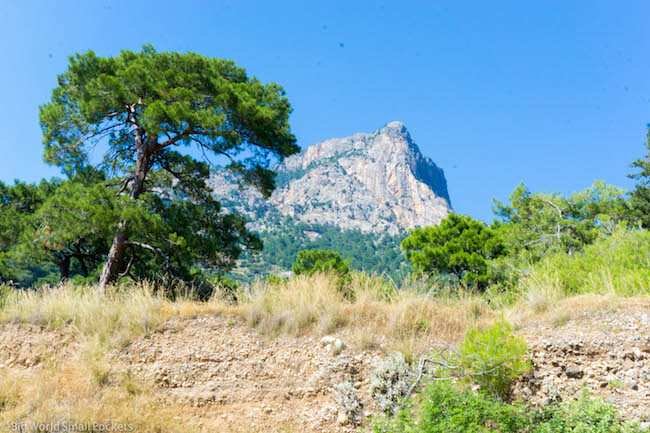 The famous Lycian Way – Turkey’s premier long hiking trail – and supposedly one of the best in the world, actually threads through Kabak, so if you do feel a little more active, hiking along some of it is totally possible right from the beach. 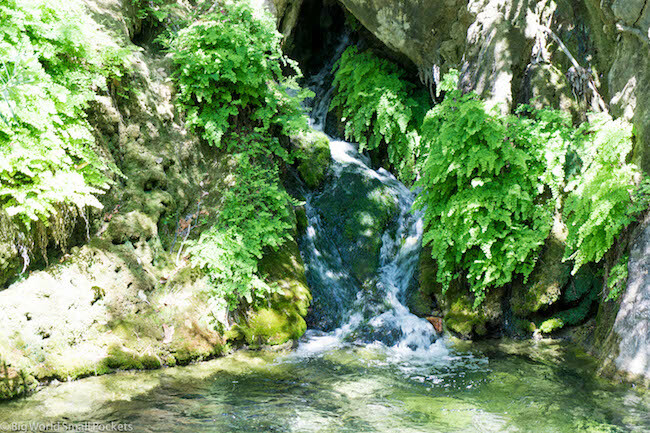 One of the best places to take a day hike to from Kabak is the nearby waterfall. 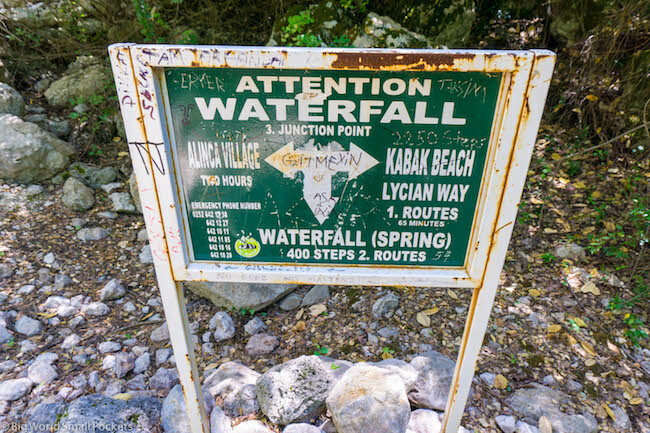 Well signposted – this is a great walk that takes you high up the Kabak Valley, revealing some incredible views and the possibility to take a dip in the freezing mountain stream that flows from the bottom of the falls. Aside from that, there’s not many places to go in Kabak and not many things to do. Just ease into the vibe care of the nearest hammock and enjoy the world going slowly by. 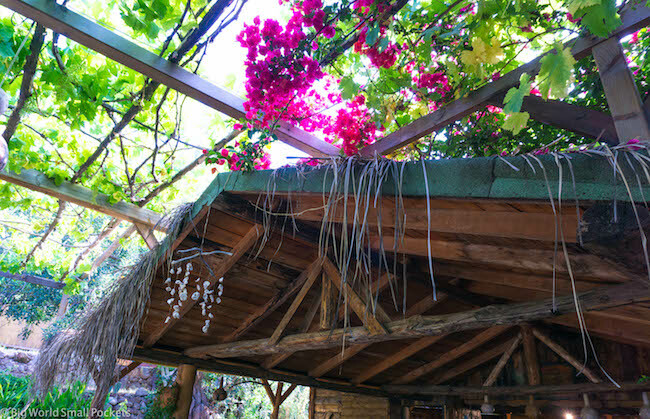 Because Kabak is a protected valley, the building of permanent structures is largely forbidden here, which is why all accommodation is essentially formed of wooden chalets and camping huts, built from natural materials and hidden beneath the canopy of this forested paradise. Or so it seems from the bus stop at the top of the village, for when you get down into the valley, you’ll quickly realise there’s actually lots of different accommodation places, and that the resulting chalets and campsites are piled almost on top of each other as they cascade up the side of the valley floor. 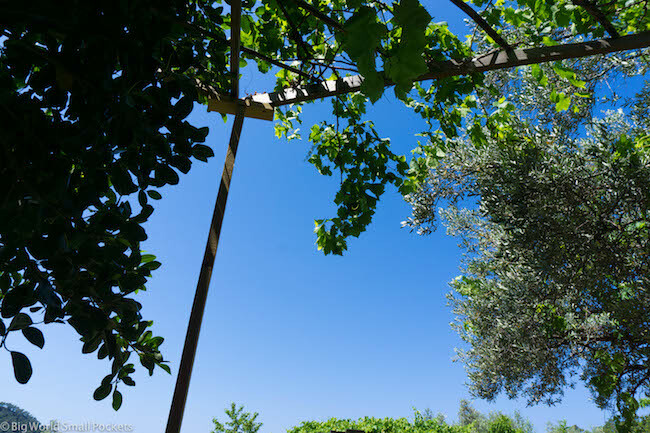 Varying in price and level of facilities – ranging from basic to extreme glamping – the main factors to consider are how close to the beach you want to be, how much you need wifi and how amazing a view you want! Given the lack of shops or other facilities in Kabak, most accommodation offerings here operate on a half board basis – that is with breakfast and dinner all built into the pricing system. 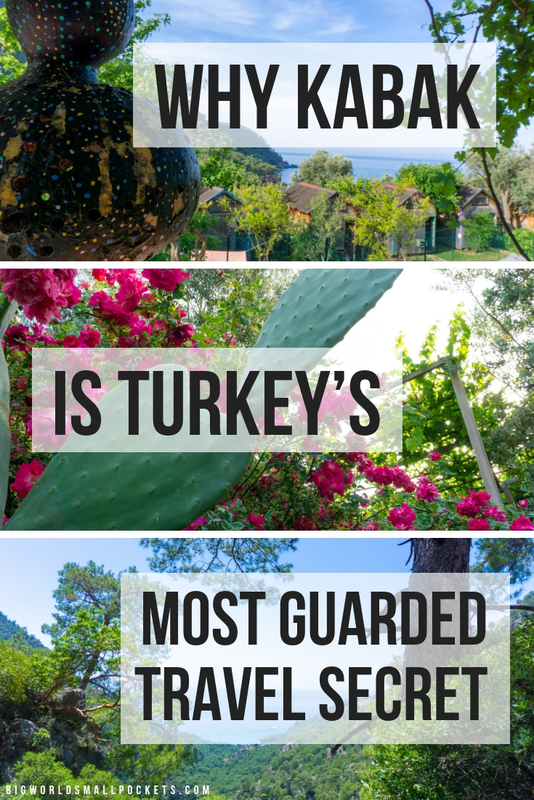 Given how cheap Turkey is however, the vast majority are still insanely reasonable, so don’t be afraid budget travellers – Kabak is more than accessible to you. One of the cheapest camps, which has an excellent location and is staffed by a friendly and sociable group of young Turks is Reflections Camp. I’d definitely recommend choosing this place if you’re a solo backpacker looking for a company and some affordable prices. I visited Kabak for 10 days in mid-May and honestly thought it was the perfect time. Right at the beginning of the season, the crowds were delightfully thin – perhaps adding to my love of this place even more! In the main season, that’s June – August, I can imagine the place gets pretty busy and given how small it is, it’s not hard to imagine just how crowded and hectic it could easily become, even if those crowds are mostly mega-chilled out alternative types. Nevertheless, I’d definitely stick to the shoulder season when visiting Kabak, with May and late September / early October being my pick of the bunch for balancing good weather and not too many people. Needless to say, prices are also better during the non-peak months. If visiting during winter you’ll need to check which accommodation options in Kabak are open, as many close their doors after October / November. In summer you’ll need to book in advance as places fill up quickly, especially at the weekend. I’ve just covered my tips for when to visit Kabak, so my other main bits of advice refer largely to what to bring with you. 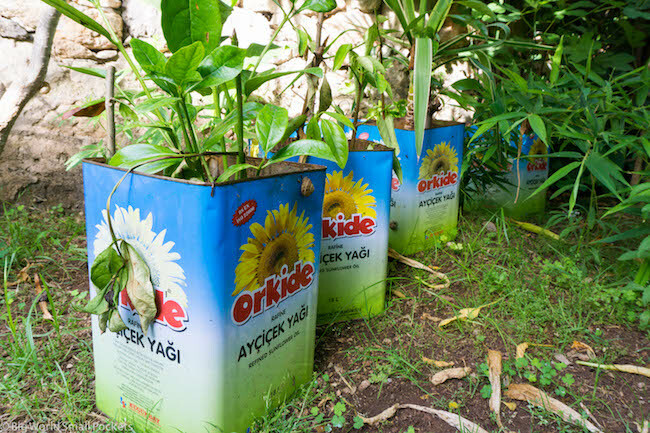 Essentially bring everything you need to Kabak – don’t rely on anything being available here and don’t rely on the fact you’ll make the effort to leave merely to get supplies! While there are a few small shops in Kabak, it’s impossible to know what they will and won’t have in stock. And of course, you’ll also pay more than you need to here to buy them. Instead, stock up in Fethiye before you hop on the shuttlebus. The Carrefour Supermarket near the bus station in this city is well-stocked and buying some snacks here, plus any toiletries etc you might need, is going to be a lot easier than catching the bus back here from Kabak for a shop run! It’s also a good idea to think about what you’ll carry everything in, because with that trek down to the valley from the top bus stop, the only option really is a backpack. Trust me, wheeled suitcases are not going to cut it. If bringing a suitcase is unavoidable for you, then you will be pleased to know you can pay a “bus driver” to take you down the 1 paved track to the beach at Kabak, but it’s going to set you back a good few dollars unless you can find some people to share it with. Which brings me onto my next point which is, namely, to make sure you bring all the cash you need to Kabak as there’s no ATM here. Some accommodation options allow you to pay by card, but not all. Also, if you want to save even more money when you’re here, bring your own camping gear. Many places, allow you to pitch your own tent and use their facilities for a fraction of the price of a room, hut or chalet. 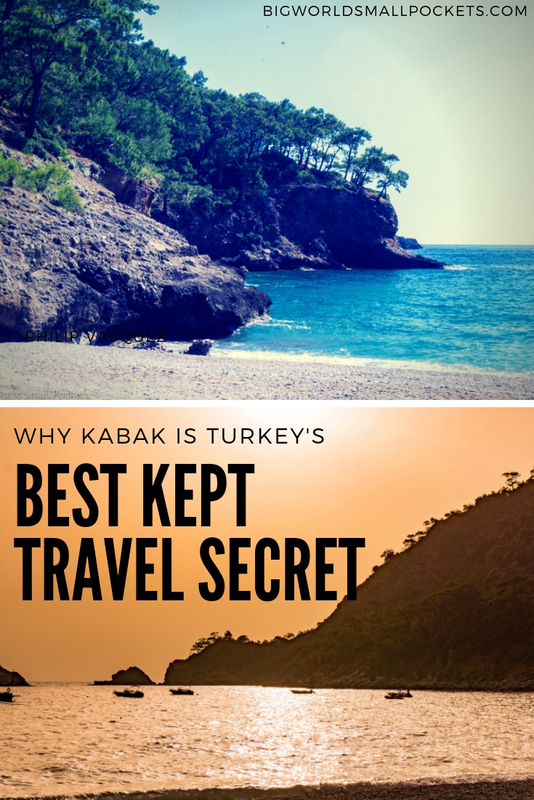 So there you have it, my take on why Kabak is Turkey’s most guarded travel secret. Can you see now why I was hesitant to spill the beans?! But at the same time, can you blame me? !